January 6, 2012 /190 Comments/in Featured Articles, Historical Anti-Jewish Writing /by Tom Sunic, Ph.D.
What follows is the English translation of the little known closing speech, given by Prof. Dr. Carl Schmitt at a conference held in Berlin, Germany, on October 3 and 4, 1936. The conference, sponsored by Reich Minister Dr. Hans Frank, was attended by hundreds of German legal scholars, law professors and political scientists, most of them affiliated with the National Socialist regime. The speeches and minutes of the two-day conference were subsequently published in several separate short volumes under the title Jews in Jurisprudence (Das Judentum in der Rechtswissenschaft) and are available in the German language on line. 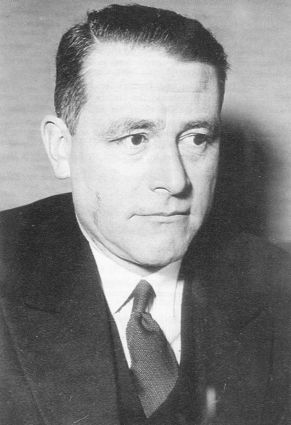 Carl Schmitt (also Karl Schmitt and Carl Schmitt-Dorotic) was a German legal scholar, philosopher, political scientist and critic of liberal parliamentarianism. His voluminous writings span the fields of international law, political theory, comparative linguistics, geopolitics, philosophy of history and comparative literature. After WWII, Schmitt, along with hundreds of thousands of German and other European professors, teachers and academics, was subject to the process of “denazification” and was removed from all academic and teaching positions by the American occupying authorities. Some contemporary critics consider Schmitt a big time opportunist and “Hitler’s Crown Jurist.” While acknowledging Schmitt’s influence on modern political thinkers, some of his contemporary (mostly Jewish) critics, like Steven E. Aschheim, from Hebrew University in Jerusalem, also note how “Schmitt’s anti-Semitism demonstrates in great and nuanced detail how his anti-Jewish attitudes permeated the very structure and grounds of his thought and categories.” The speech reproduced here clearly shows Schmitt as a completely accepting the National Socialist world view. Over the last 30 years, however, Schmitt’s works have gained immense popularity, both in the USA and Europe, among leftist, conservative, liberal and rightwing scholars. Recently, most of his work has been translated into English. Of significant academic interest today are Schmitt’s theories on “just vs. unjust war,” on “limited vs. total warfare,” on the “notion of the political” in different political systems and on the “state of emergency.” His theories on the legal status of “terrorists”, “freedom fighters” and “disarmed enemy combatants,” on guerilla and partisan warfare, are debated today by many legal experts, including military establishments and colleges all over the world. ‘C. Schmitt’ is a household name for many nationalist intellectuals and nationalist parties in Europe (see my Against Democracy and Equality). After WWII, many of Schmitt’s theories exerted considerable influence on numerous American professors and authors, especially in the USA — although many of them have never made any explicit reference to, or acknowledgment of Schmitt’s works. This seems to be the case with prominent US Jewish authors of the so-called Realist School in political science, legal scholars and opinion makers, such as Henry Kissinger, Hans Kelsen, Michael Walzer, Hans Morgenthau, Morton Kaplan, Hannah Arendt, etc. — authors whose books and theories continue to exert a strong influence in the study of domestic and international law and international affairs, and whose theories have significantly shaped US foreign policy since WWII. To my knowledge the following speech by Carl Schmitt has never been translated or reproduced in English. It is important to note, however, that other than this short anti-Jewish speech, nowhere else in his earlier or later work does Carl Schmitt discuss Judaism, Jewishness, or makes the slightest critical or laudatory comment about the Jews. Notice in particular the theme that Jewish identity influences Jewish legal scholarship, and that Jewish scholarship is an aspect of ethnic conflict—“a weapon aimed at us.” While certainly not true of all Jewish scholarship, there can be little doubt that there are indeed conflicts of interest between Jews and non-Jews over the construction of culture—the thesis of The Culture of Critique. Legal scholarship and advocacy are certainly no exceptions. Given this conflict, Schmitt emphasizes that the identity of Jewish writers should be made known and that German legal scholarship should develop in its own direction, excluding Jewish influence. Schmitt’s speech is a good example of the National Socialist effort to expunge Jewish cultural influences from Germany. Notice particularly Schmitt’s comment that “on the one hand we keep pointing to the necessary fight against the Jewish spirit, yet on the other hand, at the end of 1936, a seminar library in legal studies looks as if the greater part of the legal literature is being produced by Jews. ” Quite clearly, Jews, constituting less than 1% of German citizens, remained an elite well into the National Socialist period. As all presentations have demonstrated, Jewish law appears to be redemption from chaos. The polarity of Jewish chaos and Jewish legalism, of anarchic nihilism and positivistic normativism, of coarse sensualist materialism and abstract moralism, appears so clearly and so vividly before our eye, that we can use this fact — similar to the studies of racial psychology — as a scientific finding in our meetings for our future work. Therefore, in the capacity of German guardians of law and professors of law, for the first time we have made a contribution to the significant research already carried out in the realm of race studies. In this teamwork of ours, over the last two days, we have arrived at the initial conclusion which preserves the honor of our science in conjunction with other accomplishments, and which, as was rightly pointed out by Dr. Falk Ruttke, are accomplishments that can serve us as models. 1. The necessary task regarding the bibliography is very difficult. What is needed is to determine, as accurately as possible, who is Jewish and who is not. The smallest errors in this respect may be blown out of proportion, lead to confusion, and help the enemies of National Socialism score cheap triumphs. Also, these errors could have a damaging effect in view of the fact that young students can be distracted from the main ideas by small inaccuracies, whereas on the basis of the false sense of justice — so common to our German way — they may readily be inclined to ponder over an isolated case of inaccuracy, instead of focusing on the big and just issue for which we are fighting. Thus, only when we solve the issue of the quotations, we will be able to remove the Jewish-infected literature [von Juden infiziertes], and attain, instead, German legal literature. The problem of the quotations is not only of a practical nature; it is a fundamental problem. One can recognize an individual writer by the way he uses quotations. I’d like to point to the brazen matter-of-factness of the Vienna School of the Jew [Hans] Kelsen, where everybody quotes each other, with other opinions being neglected — to us Germans an incomprehensible cruelty and insolence. The issue of the citations is not a trivial matter. There are today, as far as the Jewish question is concerned, no more trivial matters. Everything is very closely connected and intimate as soon as the real battle of worldviews starts. The issue of the quotations will lead to necessary clarification regarding many other individual issues, such as the issue of quoting half-Jews and those closely-related to Jews. I’ll warn right at the beginning against putting in the center of attention fringe issues and interposed issues. This is a standard way of avoiding clear cut decisions. There are hundreds of cases where it is beyond doubt that they are full Jews [Volljuden]. It is a typical Jewish trick to divert the attention from the heart of the matter to the doubt- related issues, to the fringe issues and to the interposed issues. Authors, with who there is no doubt that they are full Jews (Volljuden), will be in the future in our German legal literature, referred to as Jews. When, for an objective reason it becomes necessary to quote Jewish authors, this will be done only with the addition of the word “Jewish.” By the mere mentioning of the word “Jewish” a healing exorcism will start. 4. The last practical goal is related to the issue of scientific research, particularly regarding dissertations. A lot of good material for doctoral dissertations has emerged from the presentations of these two days. I do not think it is necessary that still 70 to 80 percent of hundreds of doctoral dissertations, which see the light today in Germany, continue to be written ​​in the same old style of civil code and penal code dissertations. Again, this is a serious matter, considering how much talent and intellectual potential exists among German youth and what it means when German law professors in charge of the education and the scientific training of these young Germans, steer these young people to distracting topics and away from the daily life of the German people. Here we have a professional task of first-rate importance. If one keeps in mind what has been concluded in this conference on the dissertation themes alone, concerning the legal historical and constitutional historical approaches — as well as the research into the Jewish mind and its influence on German intellectual life in its “intersection” with the German mind, as was very clearly remarked by one of the speakers — it does not seem to be difficult to draw the attention of a young student to the influence of Lasker, Friedberg, and Johann Jacoby [19th-century German-Jewish liberal legal thinkers and politicians] on German legal developments, or better yet encourage a student to study the rise of the civil procedure code and penal procedure code, as well as other laws in relationship to Jewish influence, or have the student focus his attention on the issue of “Jews and the concept of the rule-of-law-state.” There is no lack of dissertation themes and it would be the most stupid negligence if these new themes were not addressed. III. But most importantly, what turned out in these past days to be the definitive conclusion, is that Jewish opinions, with their intellectual content, cannot be put on the same level with the opinions of German or other non-Jewish authors. We all became aware with the greatest clarity as to this supposed difficulty, such as when there are Jews expressing national and patriotic views, as was the case with the famed Stahl-Jolson. Over and over again in our conference we have come to realize that the Jew is sterile and unproductive for the German type of spirit. He has nothing to say to us, however shrewdly he may keep deducing [kombinieren], or even eagerly wishing to assimilate himself. Of course, he may play around with his enormous mediation and mercantile skills — but as far as the substance is concerned he creates nothing. It is a sign of the lack of training in the study of race and hence in the National Socialist thought to overlook this and to assume that there is a more substantial problem behind this, such as some Jews speaking and writing in nationalist terms, some in internationalist terms — that they can advocate at a moment’s notice conservative, liberal, subjective, or objective theories. Even the much vaunted skills of criticism of the Jew are the product of his mismatch to everything essential and genuine. It is a completely different concept of criticism from the one used by German law professors acting in a genuine teamwork, criticizing each other or promoting each other. Nor is it correct to depict the Jew as a very logical, very conceptual, constructive, or rational person. It is not so much his “care-free logical sharpness” [unbekümmerte logische Schärfe] — what we ourselves mean by logic, but a weapon aimed at us; it stems from the disproportion concerning the topic and the matter.